The Scottish couple will become the first husband and wife to compete against one another in a professional golf tournament this week, with the pair set to do battle in the innovative event which features players from the European Challenge Tour, Staysure Tour and Ladies European Tour. Although the couple met playing the game of golf, they admit there will be no love lost out on the course tomorrow when the tournament gets under way at Ayla Golf Club, on the Red Sea coast. “In terms of our finances, if we found ourselves coming down the stretch battling it out for the win that would be ideal – although it might not do much for the relationship,” said Scott, a player on the Challenge Tour who has won the Kazakhstan Open in 2012. “We are both very competitive when we play each other and I probably do win most of the time. But Kylie has been coming into a good patch and beat me the other day. 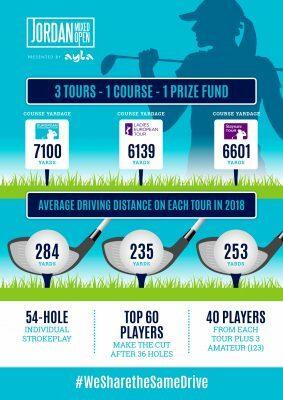 The Henrys will each face a slightly different test this week, with the course set up at 7,100 yards for the Challenge Tour professionals, 6,601 for the over-50 players and 6,139 for the female competitors. While Kylie, who is a two-time winner on the Ladies European Tour, admits there will be some rivalry, she does confess she’ll be transparent in her approach and they will both return to married life quickly once each day’s play is over. “We won’t hide anything from each other in terms of strategy on how to play the course,” she said. “We’re both really supportive of each other’s golf and we help each other as much as we can. We’ll discuss how our round goes, but then the golf chat is quickly finished, and we get back to just regular life together. Both players also admit how significant this week is for all three tours and golf more broadly, with 40 players from the Ladies European Tour, 40 from the Challenge Tour and 40 from the Staysure Tour all competing for the same first prize. “This is a huge week for women’s golf,” Kylie said. “I think all the exposure that women’s golf can get is going to help, and if more girls and more women take the game up it’s a win-win situation. Also in the field this week are another couple – Norway’s Marianne Sakrnpnord and her fiancée Richard Green – who will also compete for a share of the $393,000 prize fund.